Choosing which cruise to go on seems simple to some – you search the dates you want to travel, find a good price, and book your ticket. Unfortunately, the process isn’t as clear-cut as that (unless you have absolutely no specific desires and just want to get out on the open seas). I had never been on a cruise before, so you can’t blame me for researching every cruise line and ship that was available. It was a little overwhelming at first, but I finally settled on the Royal Caribbean Enchantment of the Seas. 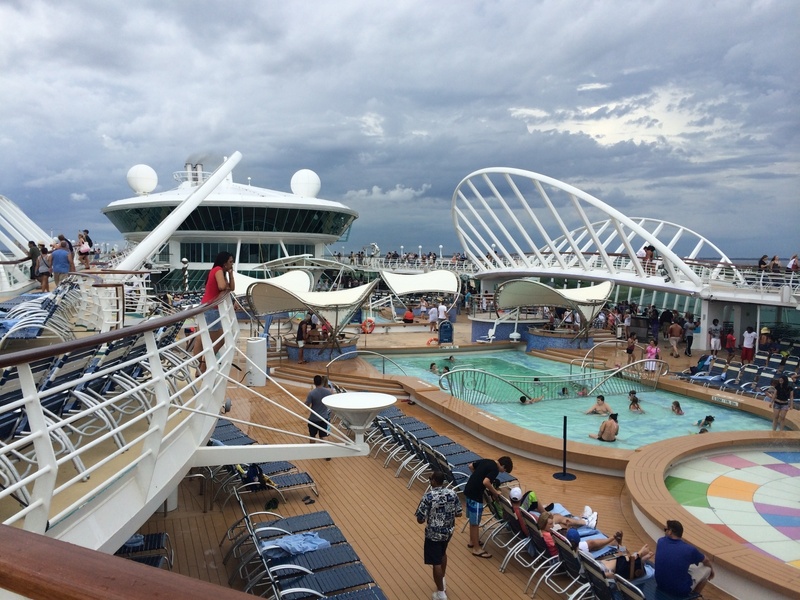 After the short, but refreshing, three-day vacation, I can’t say enough good things about my experience on the ship. As much as I would love to include all of the highlights of my trip, I will spare you a novel and instead focus on some of the key highlights so that you can decide whether this ship is the right one for your next adventure. The Enchantment of the Seas may not be the biggest and most elaborate ship out there (sorry kids, no water slides here), but it’s a beauty on the inside! 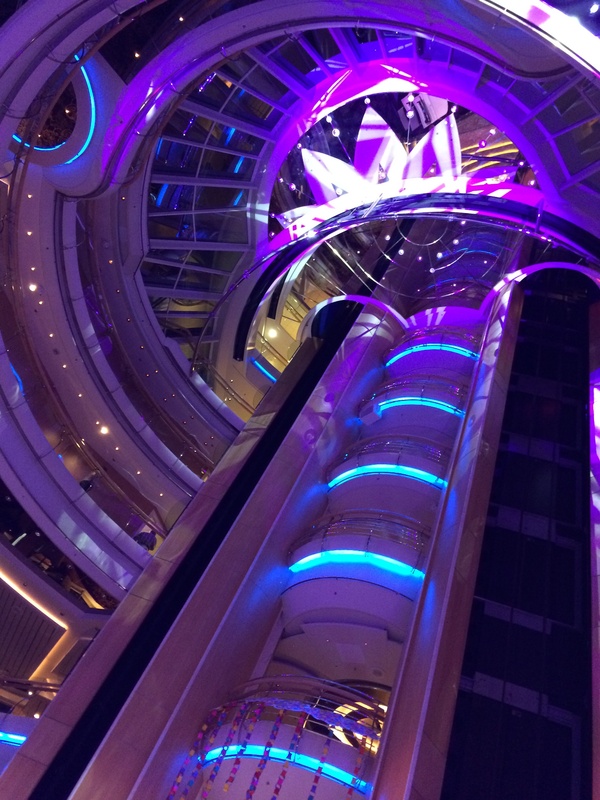 If you make your way to deck 4 of the ship, you will be greeted with the Centrum – an entertainment area that can be seen all the way up to deck 10. This was one of my favorite places to spend time because the environment was inviting, the activities were a blast, and everything was kept clean. Some reviewers have mentioned wear and tear on the ship, but I did not see any evidence of that. In my opinion, the Royal Caribbean staff did a great job of cleaning everything and answering maintenance calls when any were made. The only areas that I would call bland were the deck corridors where the staterooms were, but I wasn’t expecting much decoration there anyway. Honestly, you won’t spend much time in your stateroom anyway, so I wouldn’t let a few boring walls keep you from getting on this ship! I can’t say enough good things about the main dining room, My Fair Lady. 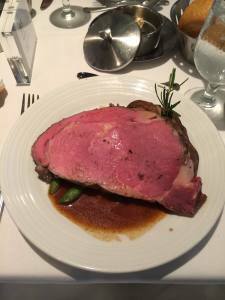 When you complete your cruise paperwork, you have the option of deciding whether you want to eat at a specific time every night or whether you would like flexibility (called My Time Dining). We opted for My Time Dining since we wanted to see when all the major activities were going to take place. After looking at the itinerary, we decided on a 6 p.m. dinnertime so that we could have time to make it to the shows that started just after 7. We made a reservation at the My Fair Lady desk on deck 5 and were easily accommodated. We had three dinners at My Fair Lady – two casuals and one formal (which took place the second night). We were able to get the same table every night which meant that we had the same waiter and assistant – something I was happy about! Nilesh was our main waiter and he did a great job of answering our questions and getting our orders right. He also gets bonus points for not giving me heck about getting two desserts – thanks Nilesh! Jose was our assistant and he was on top of our drinks and bread every night. He was very easy to have a conversation with and was always welcoming us with a smile. He told us that he had been on the ship for 7 ½ months and was getting ready to go home in a few weeks. Talk about dedication! The food itself was great as well. I had linguini the first night, beef tenderloin the second, and lasagna the third. My food was always served at just the right temperature and was the perfect portion. I also had an appetizer prior to each entrée and ended it all with a dessert or two. I’m already missing the food at My Fair Lady! The employees who were outside the Windjammer might have been the most enthusiastic people on the ship. They would sing in the morning and always greet everyone with a smile and hello. I liked how they made us feel excited for the day. Although the staff was great there, I wasn’t as impressed with the Windjammer food. We only ate there a couple of times and that was strictly for convenience. Don’t get me wrong – there are plenty of food options there, but I think there is much better food available elsewhere. We decided to order breakfast in our stateroom one of the mornings just so that we could avoid the Windjammer. The Park Café is kind of hidden in the Solarium (deck 9 in the back of the ship), but it’s definitely a great place to stop for a bite to eat, especially when you initially board the ship. There aren’t as many choices here, but you can find an assortment of salads, sandwiches, soups, and desserts. Personally, I found the food at Park Café to be tasty and satisfying – definitely better than the Windjammer (it also gets bonus points for not being as busy). Royal Caribbean offers a wide range of shore excursions to choose from no matter what age you are. The Enchantment of the Seas ports at Nassau, Bahamas first and offers excursions such as snorkeling, Atlantis, and dolphin encounters. We chose to go on the Seahorse snorkeling excursion which cost about $50 per person. 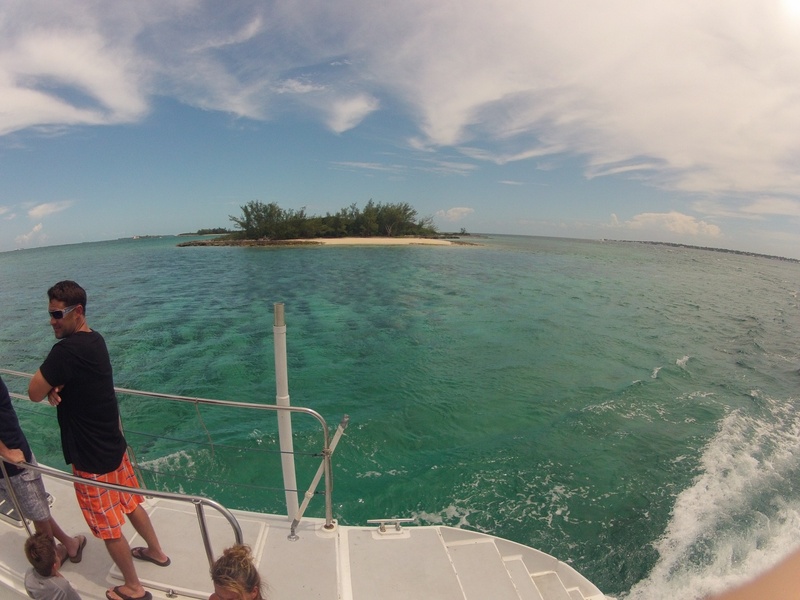 The catamaran we got on was very smooth and offered ample room for the 50 people we had on-board. The staff were friendly and made sure everyone had the equipment needed to snorkel. As we rode out to the reef area, we passed several mansions that were amazing to look at. The ride to the snorkeling site took about an hour, so we had time to enjoy the boat and the beautiful surroundings. When we finally reached our location, we put on our gear and jumped into the water. I was in awe at all the fish there were! I saw more colorful fish in that one location than I had ever seen in my life. Some reviews I had read said that the snorkeling area was too small, but I highly disagree with them. The only negative comment I would say about the entire excursion is that my goggles leaked water, but that didn’t stop me from having a good time. We were able to stay in the water for one hour before we had to get back on the catamaran and head back to the port. On the ride back, the staff offered all the adults rum and punch to enjoy. We listened to some fun music and the staff and some cruisers even did the Cupid Shuffle on the front of the ship while we were docking! It was a great time! 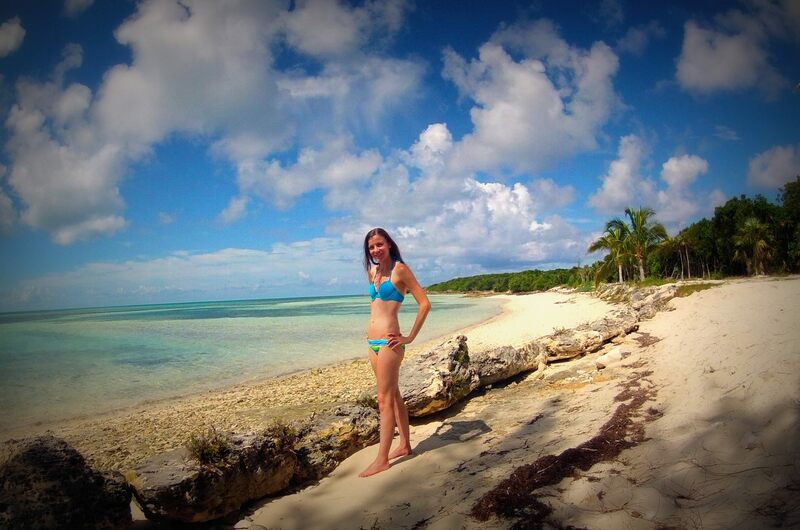 I would like to put all of the negative reviews to rest about CocoCay – this place is awesome!!! Walk all the way to the back of the island – This is where most people go wrong! You will notice that there are a ton of beach chairs toward the front of the island where the tender drops you off – don’t stop there! Those chairs fill up quickly and make you feel claustrophobic. Instead, keep walking down the trail until you get to a place called Barefoot Beach (past the giant slide and water slides). There are plenty of beach chairs there that only a few people make their way to. If you want to, you can keep walking all the way to the back of the island – this is where we ended up doing our own snorkeling. We even saw a sting ray while we were out there! Definitely worth the walk. Go to the BBQ around 1 p.m. – Lunch is served on the island from 12 p.m. to 2 p.m., so you can only imagine how crazy it gets once the clock strikes noon. I was surprised at how tasty the food was! Not only was my hamburger delicious, but the rice with black beans was amazing, and the chocolate chip cookies were super soft! Leave the island around 3 or 3:30 – The last tender departs Coco Cay at 4:30 p.m., so I recommend getting on one of the earlier ones. We were absolutely wiped out after our day in the sun, so we washed up and watched some football (yes, we had ESPN on the ship) before our 6 p.m. dinner. I had a blast going to all of the different shows that were on the Enchantment of the Seas! Marc, our cruise director, and Enzo, our activities manager, were both high energy and did an amazing job of making sure we were laughing and smiling all night. A Great Ship for Anyone! Since the cruise I went on was only three days, I didn’t get a chance to do everything (there was also a rock climbing wall and bungee trampolines), but I can honestly say that I enjoyed everything I did on the cruise. I was nervous because it was my first time being on a ship, but those nerves were put to rest once I saw how much there was to do onboard. I would highly recommend this ship to anyone who is new to cruising or is looking for a quick getaway! Thanks for stopping by Brittany! I looked on your website and see that you live in NC – I do too! We ended up driving to Port Canaveral, Florida to catch our cruise because that was the only port that had dates that worked for us. Although the drive was a little longer than I had hoped for, the cruise was definitely a great time – I would do it again in a heartbeat. Take advantage of all the great activities on-board the ship when you set sail 🙂 Hopefully I’ll get to read about your cruise adventure in the future sometime!